There are seasons for DJ services on the mainland. Wedding season in the spring. Birthday parties dominate the summer. Maui is different. It’s always paradise … and always a perfect time for a party! We’re always ready with sound systems, dance floor rentals, specialty lighting, and, of course, DJ services to make your event amazing. 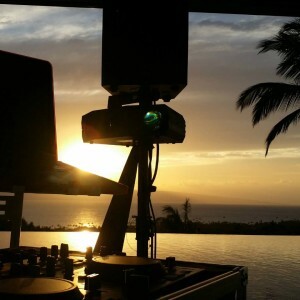 There are no bad times for a party on Maui. We have beach weddings every day of the week, not just the weekends. Birthday parties and anniversaries celebrations take place outside year-round, too. In fact, every evening we’re fortunate enough to witness some of the most spectacular sunsets in the world. It’s a nightly event attended by thousands! No matter your cause for celebration, KCK Entertainment is ready to make your party unique. It is our Motto to ensure "Detailed Service with an Aloha Touch." We have detailed our services for those special Maui Weddings, Conventions, and Plain just any reason to Party. We have performed at hundreds of Weddings and Convention Engagements. It is our job to make your event special and memorable. We are located on the West Side of Maui and have formed special relationships with many of Maui's Best Wedding Planners, Photographers and Photo Booths as well as many of the 4 and 5 star Resorts within the Kaanapali and Kapalua areas. If you want to get away from the resorts we know a lot of beautiful places to hold your special event as well. No matter what the need, we are here for you. Just The Right Lighting And Sound Levels For Your Event. I’ll Always Bring A Little Extra. Call Us Now: (808) 206-5905 for KCK Entertainment 2015 ~ Providers of Maui Lighting and Sound for your special event.